I'm about to restart the game for some people and thought I would share the ending stats for the previous game. There were 46,800 tiles placed and 8,689 buildings built. Below was the final state of the map. I'm on a roll this week. 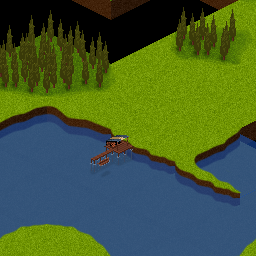 I've added fishing boats and catapults. Fishing boats will kind of act as mobile food producers. They will give a 25% chance of food for each adjacent empty pure water tile. This should give a non military incentive for building lakes, rivers, and oceans. They have 1 hit point and will do no damage in combat. Catapults will finally make it easier to get through enemy walls and buildings. They have 1 hit point and will do no damage to other units. If used to attack a structure such as a wall or capital, they will do 10 points of damage each attack. Right now you have to move right up on your target to deal damage with catapults, but once I've implemented ranged attacks - they will be able to attack structures from a few tiles away. I just finished adding in docks. They will be the most basic version of a port. You will be able to build fishing boats from the basic one and military ships from the larger versions. 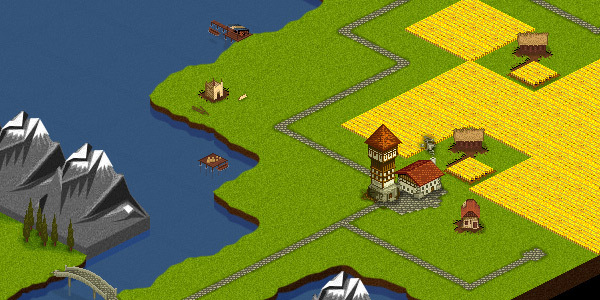 At this point I'm planning on adding in fishing boats, catapults, and maybe watch towers and messenger stables before starting the next game. I am also trying to document all the buildings and functionality of the game in a player guide that you can find on the menu to the right. Hopefully this will help the new players in case they have trouble. This is a map of the entire game world of Tile Empires as the 25 players place their tiles. It is a time lapse of the game world over the course of about 2 months. The different colored pixels are the land tiles players are placing. This was the 2nd test game with players other than myself in it.